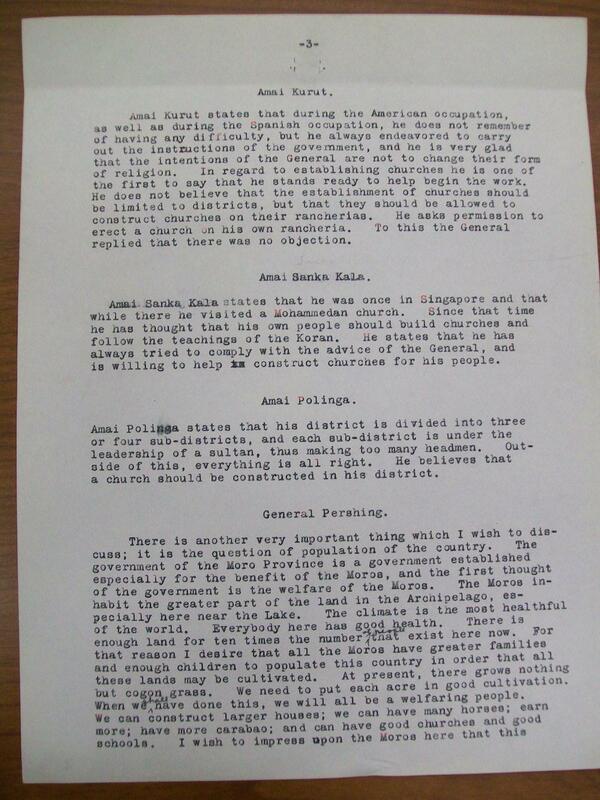 How General John Pershing actually dealt with Filipino Muslims. 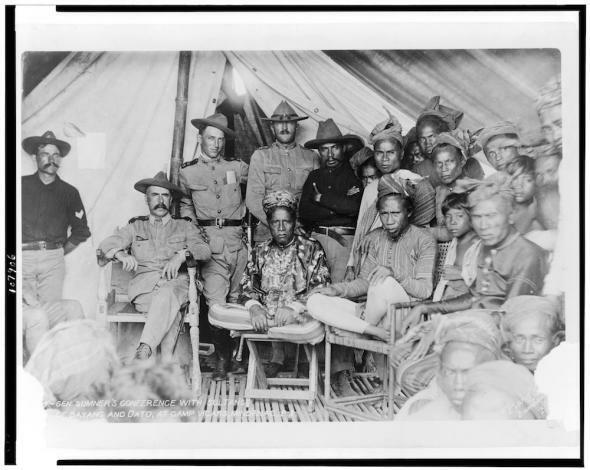 John Pershing (third from left, standing) with the Sultan of Oatu (rightmost chair), the sultan’s son (one chair over), and Datu Kurang (in front of Pershing). Pershing was best known for leading the U.S. forces on the Western front in World War I. Before his stint in Europe, the general served for years in the Philippines, which the United States had recently colonized. It took more than a decade of bloody fighting before the U.S. government considered the Philippines fully pacified. The fighting lasted longest in the southern third of the country, in the largely Muslim area known as Moroland where Pershing was stationed. In Trump’s telling, Pershing fought Filipino Muslims with little remorse. At a campaign rally last year, Trump told, with evident relish, of how Pershing captured 50 “terrorists,” dipped 50 bullets in pig’s blood, lined up his captives, and then shot 49 of them, letting the last one go to spread the news. “And for 25 years there wasn’t a problem, OK?” Trump concluded. Not OK. As Snopes and Politifact have noted, the basis for believing that anything like this happened is extremely thin. We have evidence suggesting that some militants were buried with pigs but not that Pershing was involved. It’s hard to imagine he would have been. Though he did not shirk from battle, Pershing proved remarkably sympathetic toward Filipino Muslims, called “Moros,” as a whole. He made diplomatic visits to them, making a point of going unarmed. He ate their food, learned their customs, and counted some as “strong personal friends.” He studied their language to the point where, he boasted, he could take low-level meetings without an interpreter. 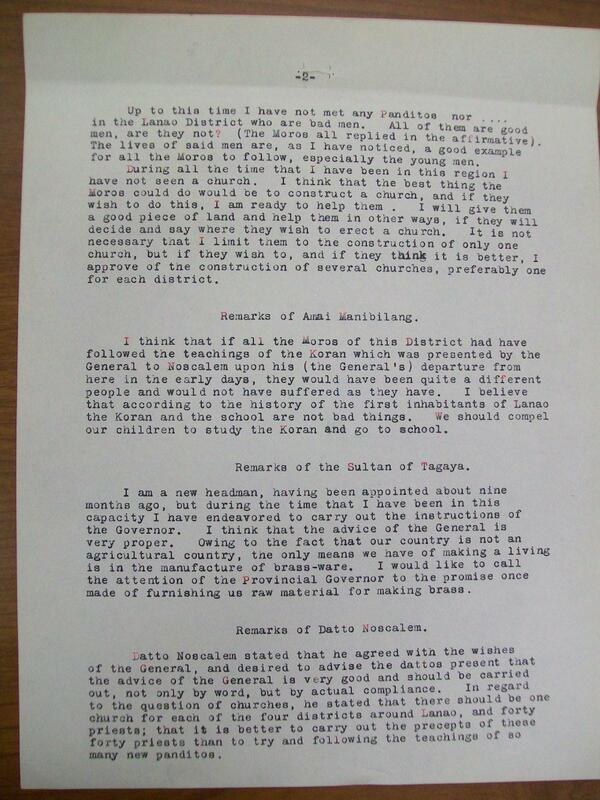 In return, Pershing was elected a datu, a position of respect and leadership in Moro society. He was the only U.S. official to be so honored. 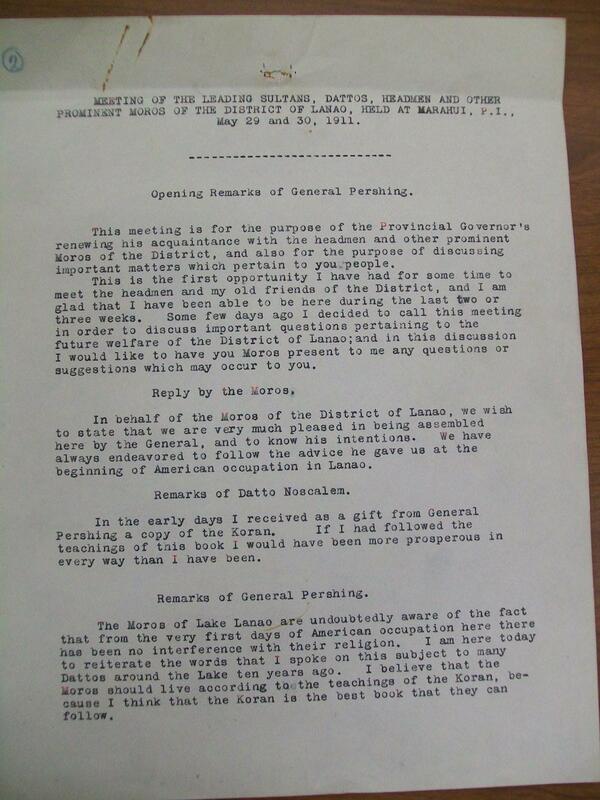 Pershing’s papers at the Library of Congress contain this transcript of an extraordinary meeting that Pershing, by then the governor of Moro Province, held with Muslim leaders of the region. For Pershing, it was a visit with “old friends.” In the transcript, one such “friend,” Datu Noscalem, recalls having received a gift from Pershing: a copy of the Quran. 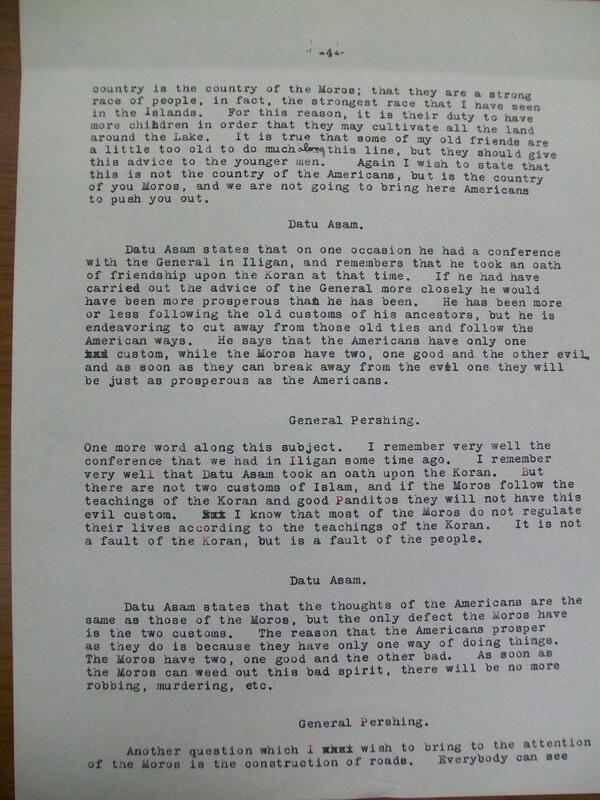 Pershing, in reply, speaks to the virtues of Islam: “The Moros should live according to the teachings of the Koran, because I think that the Koran is the best book that they can follow,” he says. It’s an admirable sentiment, brimming with tolerance for a foreign culture. Perhaps the president could learn from that.